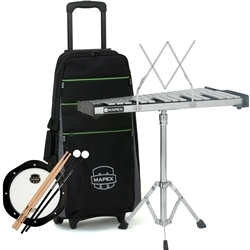 Description: Backpack Percussion Kit, 2.5 octave 32-note keyboard (F5-C8) with Silver Sparkle front rail, 1" wide tone bars, removable music rack, Innovative Percussion F12 IP-HB sticks and mallets, practice pad, adjustable stand, Integrated Roller Bag Features: Rolling backpack provides added conveniance for students unable to carry the backpack option. Adjustable stand offers convenience. Practice pad provides a more quiet option.